I met this man at a speaking event that we put together where I worked in High School. It was supposed to be a fundraiser for a library. I read it before meeting him and was impressed by what he "got away with". I think I was a little star-struck after hearing my bosses talk him up. I did NOT enjoy hearing him speak. I thought he was slimy and flaunting how he fooled everyone. I think it's gross. Yes, we have a problem with literacy in this nation. No, I will not take responsibility or feel guilt for my book-reading upbringing for a grown man who knowingly put himself in that situation. I understand how fast life happens sometimes, but at some point he should have stopped to think, "Gee, maybe I shouldn't be teaching High School when I CAN'T READ the names of my students!!" I can appreciate how hard it must have been for him to "teach himself" to read after faking it for so long, but he got caught. He didn't come out and try to fix it himself. Then, he decided to milk the situation for all it was worth and write a book to make money (since he couldn't work at the school anymore...) Whatever, dude. I still have it if anyone wants to read it. I think it's even autographed. This book took me through many different emotions. As a teacher, I was disturbed that this man manipulated people his whole life. He managed to graduate high school, college, and spent 17 years as a teacher without being able to read. As a parent, I was angry that his own children didn't inspire him to want to rectify his own illiteracy, and as a woman, I was angry, annoyed, and concerned that his wife (as well as many girls before her) enabled him by doing everything without encouraging him to get help. Most of all I still wonder, what exactly does he expect a teacher to do for a child that behaves as he did, cheating, manipulating, defying? I think he needs to accept responsibility for his lack of effort because his refusal to let anyone know the severity of his illiteracy is his to own. The book itself: The story was interesting and totally freaky. I have no idea how this dude never learned how to read and was able to trick everybody until he was almost 50! For that, I have to say that people who cannot read are NOT dumb. That said, I have no idea how after 50 years you could not pick up on ANYTHING. I went to China in May. I had no idea what any of the signs said, but I was only there 2 weeks. I think if I stayed for a year, or 50, I would have started to recognize some things. At least I probably would have learned important words like 'chocolate', 'cat', 'snooze button'. I wanted to scream and kick people when the author would mention how his teachers just dismissed the fact that he couldn't read and passed him anyways. Holy crap! Teachers?! HELLO!?!?!?!?! But then again, teachers are totally overwhelmed and have such a range of kids to teach to that I can't imagine how it would have been possible to give him the intensive extra help that he needed in order the thrive. His parents were busy making a living and never noticed his struggles. I think his family genuinely struggled to sustain themselves. But how many people now days work constantly instead of caring for and teaching their children? In some situations it is necessary and I applaud that...doing what you need to do rather than giving up and filing bankruptcy or filing for government assistance! But how many situations are there where parents are unavailable to their children, but available 24-7 by their Blackberry? Hmmm?!?!?!? Then again, I do not have children. So maybe I 'll WANT to get away from them when I do have some. Who knows. But I'll still at least make them learn the alphabet.It was brave of the author to finally admit his problem when he was almsot 50. I am going to be brave and admit, at the age of 28, that I have NO IDEA what the rules are for baseball (kickball), basketball, football, or any other sport, except for um...ok I don't know the rules for anything! One noteable embarrasing moment was in 3rd grade. We were playing kickball. I knew you kicked the ball and then ran somewhere. By some miracle my foot actually hit the ball when they threw it at me. )It was more of a defensive move than it was technique.) Someone told me to run. I ran and stood on a little plastic thing (I think it is called a 'base'). Then someone else kicked the ball and ran toward me. I ran away from them, to another plastic thingy. Eventually after several people took their turns kicking, I ran back to the starting point. Well, I proudly proclaimed that I had scored a 'home-run'! Wahoo! Then people made fun of me because apparently that was not a "home-run". Am I the only person who thinks this author's story is just false?? I don't mean it's "WOW.. unbelievable"; I mean I think this man is just lying.I taught English at a private K-12 school in Ecuador along with two other native English speakers. The other two teachers knew no Spanish, so they were illiterate in the language of the school. Of course the school knew this upon hiring them, and they were hired to teach English to non native speakers..not to teach any content in Spanish. The school made HUGE accommodations for these teachers..and even some for me, because I am bilingual but 100% a non native speaker of Spanish. They were allowed to write up students in English and we could all do the required lesson plans in English. The principal made sure that they knew all of the information we needed to know--i.e. when we had parent teacher night--since these teachers couldn't read the written notes teachers got. But it was still far for easy for these teachers! For example.. we all got our class schedules and the school forgot to translate them for the teachers; I had to. It is simply not possible that a man who claims that he couldn't read his student's names could actually have been a teacher for 17 years; did he just put random letters by every name every time he did a report card? Did he even know that "A" is a letter means "excellent" and "F" is a letter than means "failing"? How exactly did he "teach" literature if he had never read anything the students read? Yes he taught pre-common core, but how did he assign work if he couldn't even read the standard tests textbooks include enough to know the answers? And--as anyone who has made it past grade 5 or knows anyone who has knows-- high school English classes have always been about more than literature.I admit I can see how he could listen to a book on tape and then be able to discuss it with students who had read it, but it's 100% impossible that he could teach students the difference between "write", "right" and "rite" if he couldn't read. And that's "the easy part" compared to helping students learn to proofread, write clearly, etc..which an English teacher (and also a history teacher) is required to do. Teachers also have to do huge amounts of reading outside of class; everybody knows this. They have to write substitute teacher plans--some districts require teachers to have emergency plans on file in case they can't give notice they'll be absent-- read IEPs to be ready for meetings with parents, send home notes to parents, and do reading and writing assignments in in service workshops. "My wife did all of the reading for me.." just isn't a plausible story! This is one of the few books in my life that I couldn't finish. The author blames his illiteracy on his teachers. He moved constantly and never admitted to anyone that he couldn't read. He just refused to answer his teacher's questions, even in elementary school. Given that, his tendency to act like the class clown, and his fighting, how was anyone to understand that he couldn't read, as opposed to the fact that he was unwilling to read. He is also upset that one math teacher assumed that he had cheated when he let a higher-achieving student copy his answers. Again, he did not speak up. His teachers were not mind-readers. What the author does not seem to realize is that it is difficult for everyone to admit what they don't understand, but most of us do admit it to someone -a teacher, a classmate, a parent, a sibling, a priest, anyone. Is it sad that he made it through so much of his life without being able to read? Yes. Is he partially to blame for this fiasco? Yes. Are his parents and their continual moving partially to blame? Yes!Does this book show that a private (in this case, Catholic) school is not a panacea? Yes. In this era of continual testing, is it more difficult for this situation to occur? Yes. Is this another memoir about how nothing is my fault? Yes. This is an interesting story, and has a clear lesson about the educational system and changes that need to be made. However, the author has a way of not taking responsibility for things over and over again that was really made clear in the chapter he wrote about his business, I understand the educational system and teachers failing a student, but he also took absolutely no responsibility for his own lack of effort to learn for about 40 years. The book also needs far more editing.However, it's a short book and a quick read, and there's something a bit funny about reading the whole book in an afternoon. Unbelievable in a good and bad way. The book is a testament to privilege and shows how far charm and manipulation can take one. One the other hand, the man saw reason and decided to do the right thing. I can't help feeling like all of it....every bit, even the redemption, is part of the long con. Interesting and enlightening in places. I didn't agree with everything he said about the reading process. ohn attended 17 different schools before he got his first full time job.He had teachers who tried to teach him, but the marks on the page never made sense to him. He had teachers who tried to help him, but as he moved from school to school their short term efforts did not help him become literate. John was assigned again and again to the row at the back with other students who were struggling.John learned to hate being in the “dumb row.” He also eventually learned to cope with his disability by developing ways to learn through listening and observing. John learned which people were valuable assets in his “human library.” He also learned to cheat, lie and steal just to survive the system and attain his goals.One day his 3-year-old daughter asked him to read her a bedtime story. John could not, and felt a deep sense of shame as his wife cried herself to sleep.Still it was years before he reached a point where he walked into a library that had a literacy program and asked for help. John was reassured by the program’s director that he was not alone. She paired him up with a tutor who patiently spent 13 months teaching him the basic phonics skills he had never mastered as a youth. John learned the basics of reading at 48 years old.John still struggled. The words never seemed to flow easily into his brain. Then he was contacted by an expert in reading disorders and agreed to go to the Lindamood-Bell clinic for testing. There he learned that his brain could not easily distinguish between differences in sound. He could not process the difference between certain sounds like d and t. Suddenly John understood why reading had always been such a struggle for him. With specific therapy a whole new world was opened up for John, and he made huge leaps in his ability to decode and recognize words, spell, follow oral directions, and comprehend what he reads.Now John shares his story and has started a foundation to fight against illiteracy in the United States.More of his story is found in his book The Teacher Who Couldn’t Read: One man’s triumph over illiteracy, which I highly recommend. If you care about literacy, I highly recommend this true story about one man's struggles with illiteracy and what we can all learn from his story. It's not the best written book you'll ever read, but it still does an excellent job helping you understand the reasons behind why so many people in our country don't learn to read, or don't learn to read well enough to really function.It's amazing all the ways he learned to work around the system, and graduate from college even though he couldn't read. He's obviously a very smart person, who used his strengths in other areas to compensate. For example, he had excellent listening skills and could recall what he had heard. He went on to work as a teacher, and I love his stories about how he helped motivate kids to learn because he emphasized other ways to engage kids in learning (not just having them read stuff), like having them do group projects, discuss, learn by doing, etc.One sad thing I learned from this book was how so many teachers make a young child feel bad about not being able to read. I guess I knew this already, as one of my children experienced the same thing. Teachers need to be loving and encouraging, helping people learn to love learning, rather than making them feel stupid. The author was clearly a very bright child, who was made to feel stupid, and it changed his whole childhood, affected his personality, etc. He explains how he felt like an "alien" in the world of literate people. I also think he does a good job explaining how kids fall through the cracks, as teachers tell parents the child will do better next year, and never really engage parents in helping the child succeed.One down side is that the book is getting a bit dated now, talking about the issues with teaching phonics in school, which I think is now pretty widespread. But despite that one thing, it still addressed root issues of literacy problems, and gives good ideas for how to solve them.I also like how the book celebrates being a volunteer reading tutor. It inspired me to look into doing something like that.I'm very glad I read this book. While I think that Corcoran has a very compelling story, I believe that it is lost in a mire of anecdotes and metaphors. It is evident that Corcoran is a novice writer, and the book would be much stronger if it was co-written or ghost written. It felt like he was experimenting with writing tools, and every sentence that was "beautiful" (aka - metaphorical) was left in whether or not it added to the story.The pros: 1. Corcoran's experiences are important to share as not many people who were (are) illiterate will write a book about it.2. He really draws the reader in to understand how it feels to be illiterate in a literate world.3. There is something in the book that I think everyone can identify with. For me it was the multiple moves.The cons:1. I dislike the constant jumping from vignette to vignette. The chapters had "themes" but they were loosely related.2. I felt that the book was too disjointed with the themes of race, religion, phonics, and metaphors. I would have preferred to choose one unifying theme that strongly connected throughout the story.3. For a book supporting the education of people who are illiterate (and important for those folks in understanding there are others out there), I was very dismayed to find it not available in audio form. It is inaccessible to the people who could benefit most.4. I hated the preachy stuff (God, phonics, etc...). I work in a field in which phonics instruction is pretty much cut off (deaf education), so that was a bit too much for me.5. I really loved the stories about the college years. They were vivid and engaging and specific. The stories of teaching and the building company were much less so. I wish there was more of that throughout the book.Overall, I felt it was a book Corcoran had to write, but it is not something I think everyone needs to read. I suspect his story would be much more engaging by watching him speak (but I haven't done so yet). Look him up on YouTube. I'm sure he's there. In terms of literary, this book is a 0. But that's not why you read this book. It was written by a former illiterate, after all.It's clear the writer struggled with words his whole life, even now, when he has the capacity to write a book. For instance, Corcoran's thoughts are not focused (in the same page, he talks about his father's background then immediately discusses his role as the only boy of his siblings). He leaves many questions unanswered, his writing is somewhat repetitive and generalized, and for these reasons, it was not the easiest book to follow (or even keep an interest in, in some places). I also got lost in his analogies (which, he points out, he used as a coping mechanism when he couldn't say something exactly how he wanted to). However, these elements also made the book much more real, and therefore more powerful -- it's raw, passionate, and a journey through an amalgam of emotions. Many people gave this story negative reviews because of the author's deception, his blaming others for his illiteracy, the fact that his wife & colleagues enable his illiteracy, and the fact that he does not speak up and ask to be taught. But if you know and/or work with illiterates, you know that's how it works. Illiterates do what they can to survive & to not draw attention to their deficiencies. (We all do, really.) 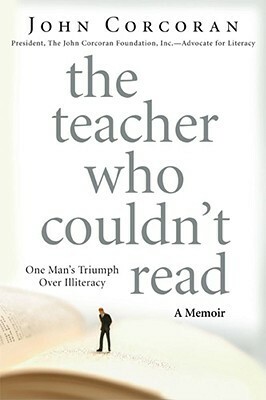 Corcoran was extremely lucky that he was able to be successful as an illiterate (a fact to which he mentions several times), but he could be a posterboy for the Typical Life of the Illiterate (adult or child).All teachers and parents should read this book. Really enjoyed this book. I started to notice all the analogies & metaphors that were used in the book. It fascinated me how he was able to deceive everyone for all those years. Not too surprising though after working in the education system. No, I don't think the teachers should hold all the blame & neither do I think they should hold all the blame when students are failing in todays classroom. Administrators/government who are constantly changing/adding to the rules without ever having to be in the trenches themselves.....& parents who think school is a baby sitter are just as much to blame.Another reviewer said that John put the blame on everyone else but himself. He does blame himself as well, but once that pattern of deception is put into place, it's very difficult for someone to suddenly say..."hey - I have a problem". Early on in his life, when this should have been caught by the experts, he was passed on with the thought that "he'd catch up". He fell thru the cracks & he made do with other skills that he possessed & tried not to bring shame upon the family. Survival mode. Did he have integrity issues? Sure. Did his students suffer b/c of his lack of basic skills or did he approach education from a different perspective & give them something else worthwhile in oral discussions? I think the latter.Readers may not agree with everything written, but I think it's well written and gives food for thought. Yes, you can be highly intelligent and illiterate at the same time. This book is now available only on Kindle. It's gone out of print for the second time, but hopefully it will be printed again soon. An amazing story that you have to read to believe. How could a person complete high school and college and become a teacher and real estate developer without reading?It is all true. I know the author and he's dedicated his life to training teachers and tutors in authentic phonetic instruction and to the belief that anyone can learn to read if taught correctly.John's courage in writing this story has given countless people the knowledge that they are not dumb or stupid; no one has ever taught them correctly how to read. There are a certain percentage of people who are able to pick up reading in childhood, but it is time to realize that for a large percentage of children this never happens. They fall through the cracks because no one at the school has any idea how to teach them properly. This growing population of illiterate people coming out of the schools is going to have a catastrophic impact on our future society. It is time to reverse this trend, and I recommend beginning with the Teacher Who Couldn't Read. An amazing book when I look back on it. John Corcoran vividly describes his inability to read and his experiences in the classroom, both as a student and as a teacher. It is amazing that he was ever able to write the book.As difficult as it was for him to become literate, he makes it seem easy to find a way to teach everyone how to read. As a library media specialist, I have a peripheral role in helping students read. My role is more to provide the material that will entice students to practice reading -- because reading is a skill which, like other skills, must be practiced. They say that once you learn to ride a bicycle, you never forget. However, you can get much worse if you don't do it for awhile.I wonder whether his methods would work for everyone. I hope so because everyone should be able to read.I can't wait to read his new book Bridge to Literacy. It's hard to believe that someone could make his way through 12 years of school, graduate from college and teach high school for 17 years without letting on that he couldn't read, but that's just what John Corcoran did. Due to a learning disability, lack of stability in school, failings in our education system, social pressures, and his own fears, among other issues, John was unable to read until the age of 48. This book chronicles his life, his feelings of inadequacy through grade school, acting out in class during his teen years, skipping high school classes, cheating his way through college and ending up on the other side of the classroom as a teacher, all the while hiding his illiteracy from family, friends, his own students and colleagues. It is an interesting story as well as a call to action for parents and educators in the fight against illiteracy. John Corcoran was a guest speaker at our library recently, after hearing him speak I decided to read his book. Although I don't agree with John that teacher's are to blame (I believe district administrators make too many time consuming nonteaching demands on teachers and force teachers to stick to pacing charts even if their students need reteaching) when a child is not able to read, John's story is not unique and it helps us to understand our student's behaviors and personal issues better.I'm reading the 1994 edition, and the bottom of page 40 is missing part of a sentence: "I bought the papers for three cents from a" Searching Amazon I found the rest of the sentence: "high school kid who was a distributor, then sold them for five cents. "Also includes a great list of resources available for those with learning disabilities. I was given a book at The Summer Institute on Neurodevelopmental Disorders I went to in Sacramento August 7-8. I looked at the book to long, I guess. The lady at the display table said that she had been given some books by the author to give to teachers. This is a wonderful book about a man that learns to read after graduating from high school, college and teaching high school for 17 years. It gives some wonderful incites into the problems I have experienced in my life reading and some good ideas of how to help learning readers so that they do not have to face the problems this man did. I would recomend this book to anyone who knows someone who can not read or is struggling to learn to read. This book was recommended reading for training I'm taking to be a literacy tutor at the library. I was most looking forward to learning about the types of day to day challenges someone who can't reads goes through and how anyone can not only get a high school diploma, but also a college degree and obtain teaching credentials without knowing how to read. From my perspective he barely touched on those issues and seemed intent on casting blame on every segment of society, teachers in particular, without acknowledging his own role. To me it was a book that pointed the finger of failure at everyone but himself. I thought the best part was where he talked about the coping skills and methods of getting through class (cheating) - clearly a person using intelligence to get through school, but not how you normally think of it. I believe many students get tested as they go into schools for phonemic awareness, etc., so if this book helped that process when it was written 20 years ago, wonderful. However, I think there are many more illiterate people in America than when it was written - so his foundation is needed more than ever. A pretty crazy story! Hard to believe,, and many people have told the author so. I wish he would have included more details, when he describes how he got around reading, and managed another way instead. The writing is very basic, but hey, he used to be illiterate, so that is to be expected. It's a bit repetitive too, but you can't blame a traumatized person for trying to bring their point across I guess. I'm glad I read it though, and it inspires me as I move into tutoring literacy myself. Not a flawless book, but an interesting read. It was absolutely amazing to read the lengths to which he went to hide his illiteracy. He was obviously intelligent, yet trapped by his reading difficulties. I don't think it is really possible for those (like me) who learned to read almost effortlessly to understand what it is like for someone who struggles with reading. While I cannot condone most of what he did the first 50 years of his life, I can applaud his willingness to finally learn to read and then admit the deceptions and move forward. This is a tough one. The author alternately presents as a jerk and inspiring. I had the hardest time deciding if his attitude about himself overrode the positive. In the end, I think he is probably an amazing man, although I'm not in any hurry to spend time in his presence. He overcame some serious obstacles and has done enormous good through telling the world about his struggles. He also has dedicated the last 20 years to helping others become literate. You can't beat that, can you? The good DOES outweigh the bad in this case. This is a mixed review. His story his fascinating - how someone could essentially fool others into thinking he could read through K-12, and then a college degree, and then through a successful business, is amazing, sad, and startling all at the same time. I do not agree that straight phonics is the answer for all students, but I can see why he feels this way. An interesting book for future and current teachers. It's sad that students can slip through the system like this. I was amazed at the lengths he went through to sneak through the educational system (the ways he cheated) and the ways he used his students to read his memos, grade papers, etc. when he was a teacher. I'm glad he learned to read and is an advocate for literacy. This is an excellent book that exposes our faulty education system when it comes to literacy. It is a must read for all teachers!! Hear from a grown man how he made it through high school, college and an earned an advanced degree without being able to read!!!! He couldn't even read basic sight words!! What an eye opener!! Made me want to learn more about helping with illiteracy in America. The end was a bit of a plug but the story was very interesting and very frustrating knowing the educators in his life did not stop to help him. This story is amazing! It should be a call to action for every person who is blessed to have learned to read easily. It makes me want to volunteer to be a adult literacy tutor or help in an elementary school reading class. Actually read this several years ago when some children in my class were having reading problems. It pointed me to several sources for helping them. I bought it again to share with a friend who is mentoring a middle school child who is having difficulty with reading.